The NLAA Invitational Indoor Track and Field Meet is to be held at the Memorial University Field House in St. John’s. The facility has a six (6) lane 200m oval and eight (8) lane sprint straight track. Change room facilities and showers are available - bring own lock and towel. Master Men and Women: Any athlete who has reached his/her 35th birthday on the day of the competition, born on February 9, 1984 or earlier (35+ yrs). The racing chair shall have two large wheels (not to exceed 70cm in diameter) and one small wheel (not to exceed 50cm in diameter). No part of the racing chair may protrude behind the vertical plane of the back edge of the rear tires nor extend in front of the center of the front wheel hub. One push rim allowed for each large wheel. It is the responsibility of the athlete to ensure that no part of his/her lower limbs can fall from the wheelchair to the ground or track during an event. The racing chair must be manually-propelled (no gears, levers or electronic steering). The athlete can propel a wheelchair independently. No delay due to equipment failure. Athlete must have a racing helmet that is a hard protective shell and recognized with an international safety standard. Athlete can use racing gloves (soft or hard gloves). In wheelchair races the time shall be taken to the moment in which the centre of the axle of the leading wheel reaches the vertical plane of the nearer edge of the finish line. Each competitor is individually responsible for promptly and on time reporting for each event entered. Athletes should be ready to compete shortly after they are called to the start. Practice time before each start will be kept to a minimum, 1-2 minutes. There is no limit to the number of events a competitor may enter. Athletes are asked to make a choice as these events may be run simultaneously or back-to-back with no rest time in between. There is no limit to the number of entries per school or club. The 60m, 300m, 600m, 1000m, (except 1500m/3000m only to U16/U18/U20/Snr/Mas) events are open to all age categories. All events will be run as Timed Section Finals (TSF). In all events, U14 age athletes will compete first followed by the next age category. To avoid empty lanes, however, race organizers reserve the right to combine some events. Combined races: Where we have to run two or more age categories together, the events will be ranked separately. For example, in the 60m, we may have one participant in each division. In such case, there will be one race, instead of two or more races, and participants from all divisions will run together. Mixed races: Girls and Boys competing in the U14 category and Wheelchair may participate together in some of the events but will ranked separately. For all other categories, based on NLAA and Athletics Canada rules mixed gender (female and male) races are not allowed. Timing - FinishLynx Photo Finish System and Hy-Tek Meet Manager will be in use for the meet. Starting Commands for 600m/800m/1200m/2000m/3000m events: “On your marks”, the gun will be fired. Standing Start! Running in lanes for sprinting events (300m and shorter): all runners must remain in their assigned lanes for the duration of the race from start to finish. In the 50m/60m/200m/300m, each athlete will have a separate lane at the start. The races will be run entirely in lanes. In the 400m and 600m events a two (2) turn stagger start will be used with one (1) competitor per lane at the start, runners must stay in their assigned lanes during the first 2 turns, after they cross the “breakline” runners can cut into Lane 1. Start Rule modified for U14: For athletes competing in the U14 competition only, one false start will be allowed per race without disqualification of an athlete. Any further false starts shall result in disqualification of the athlete making the false start. A crouch start and the use of starting blocks is mandatory for 60m, 200m, 300m/400m events. The usage of Starting Blocks in the U14 competition is not allowed. Starting position for the U14 competition is optional in the 60m and 200m - Crouch Start, Standing or 3-point start. Middle-distance running in lanes: runners begin from a common start line and may cut to the inside lane after the first turn or crossing the breakline. Masters competitors are not required to use starting blocks, or a crouch start or have both hands in contact with the track for the start of any race. False Start: Individual athletes who are charged with a false start will be warned. Athletes who are charged with their second false start in the same race will be disqualified. No outside footwear is allowed on the track. All participants must wear indoor sneakers or gym shoes. Any shoes designed for turf sports are not allowed. Participants may not compete in their bare feet, slippers or socks. Only athletes approved by the NLAA Office may wear track spikes (3mm). ONLY 3mm STRICTLY ENFORCED: Athletes wearing spikes with spike length longer than 3mm will be asked to remove their spikes and run wearing their indoor sneakers. Athletes wearing spikes without permission will be disqualified and barred from further competition in the meet. ABSOLUTELY no spikes are to be permitted on the green synthetic surface as it will damage the floor. This regulation will be strictly enforced by field house staff and NLAA volunteers/officials. Athletes using approved spiked shoes must stay on the track surface at all times. Individual scores will be kept but no awards will be presented. There is no limit to the number of athletes a school/club can enter in an event. A bib number will be given to each participant, which is to be worn visibly on the chest. 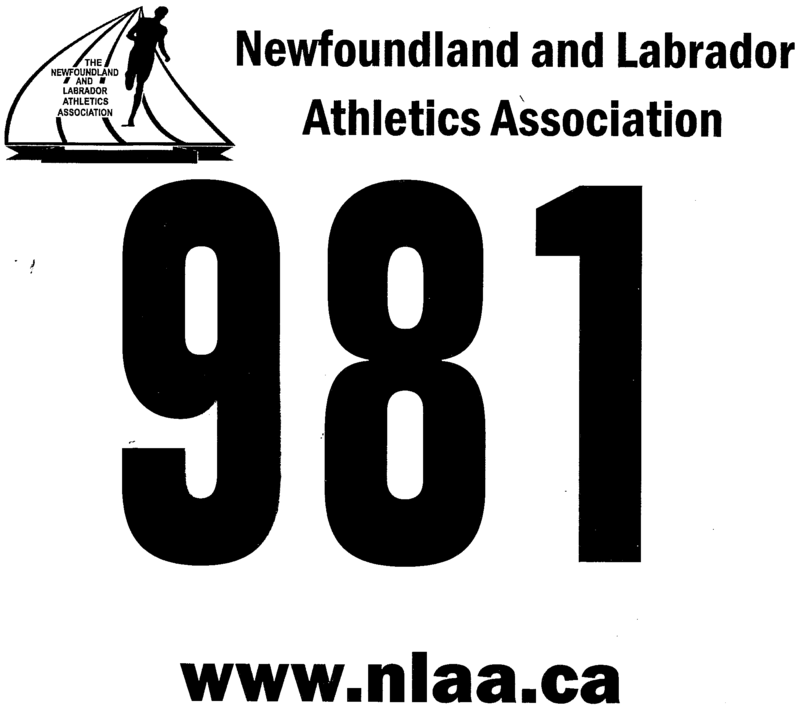 Race numbers will be available for pick up at the MUN Field House on Saturday (meet day) from 6:00 pm to 6:30 pm. A volunteer will be on-site at the field house lobby near the main desk. There will be no Technical Meeting. The lobby/sitting area of the Field House is designated as the Athlete Control Center. Only athletes reporting for their event are allowed in this area. Please use the area on the second floor of the field house for warm-up. Once all athletes have been marshaled in for competition they should not leave the designated competition area without the permission of a Meet Judge. The Meet Announcer will inform the public of the names and numbers of the athletes taking part in each event, and all relevant information such as the composition of the heats, lanes or stations drawn, and intermediate times. Event results (placing, times, heights and distances) of each event will be announced at the earliest possible moment after receipt of the information. Ten (10) minutes after the final call all competitors will be escorted by a designated official to their competition area. Athletes arriving late, after all competitors are escorted to the competition area, will not be allowed to participate in the event and will be barred from further participation in the meet. Bags will be checked for cassette recorders, walkmans, radios, ipods and other portable electronic devices as they are not allowed in the competition area.